"We are so sorry for your lost. My wife and I did not have the pleasure of knowi"
"Dano, Karen, Sophia, and Katya were always one of my most very special Fall Cree"
"Dear Karen and family, please know you are close in our thoughts and hearts duri"
"Vichnaya pamiat! A man who enjoyed life and loved people! May God keep him close"
"Condolences to Karen and his entire family"
"Dear Karen & family our condolences during this difficult time. We are deeply sa"
"Remembering all of you fondly during this difficult time. " 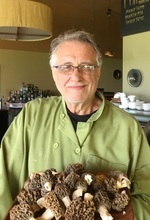 "Devoted father, husband and award-winning chef"
Dano Hutnik, 69, of Lodi, NY, passed away suddenly on Friday, May 18, 2018. A celebrated Finger Lakes region chef since 1990, he first opened and operated Dano’s on Cayuga and later Dano's Heuriger on Seneca. Dano, a former professional ballet master in Austria, graduated from the Culinary School of San Francisco before gaining acclaim as a regularly featured, award-nominated chef at the James Beard Foundation. Dano is survived by his wife and business partner, Karen Gilman, and his three daughters, Martina Migenes, Sophia and Katya Hutnik. Others surviving include: sister Oxana Rakowsky and husband Ihor; brother Ihor Hutnik and wife Oksana; mother-in-law Carol Gilman; sister-in-law Lori Gilman; three nieces; two nephews; one grandson and many friends. Calling hours will be held on Monday, May 21 between 5-8p.m., with a time of sharing remembrances at 7:00pm, at the Royce-Chedzoy Funeral Home, 212 E. 4th Street in Watkins Glen, NY. In lieu of flowers, donations may be made to the Tompkins County Society for the Prevention of Cruelty to Animals, St. Jude Children's Research Hospital or Ithaca Children's Garden. Addresses will be available at the funeral home. To send flowers to the family of Dano Hutnik, please visit our Heartfelt Sympathies Store.